Manchester FabLab allows anyone to go along and use their kit for free on Fridays and Saturdays on condition that we make public what we do. So I paid them a visit on Friday to cut myself a new enclosure for my Arduino Lilypad Binary Clock. The clock is one of the projects from my book '30 Arduino Projects for the Evil Genius'. 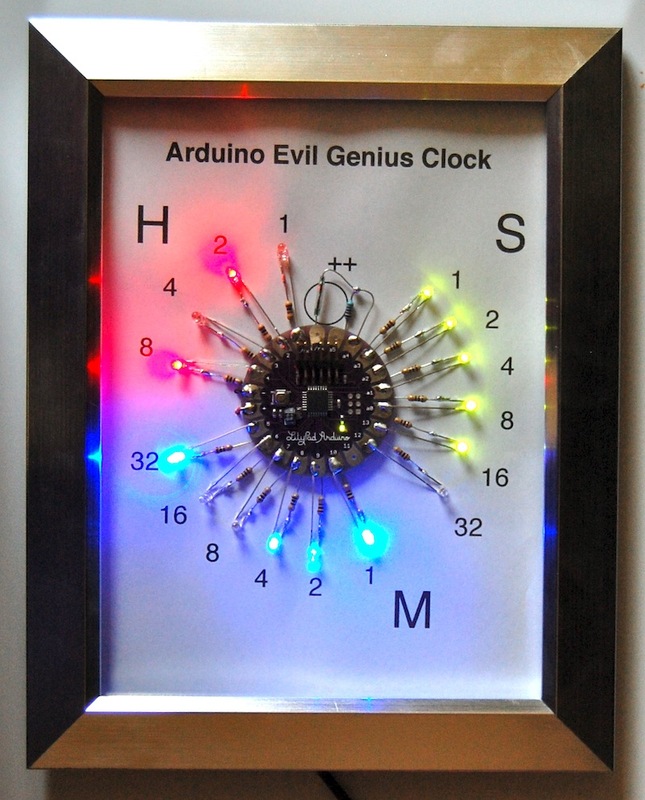 Its a binary clock with four red LEDs indicating the hour, six blue LEDs the minute and six green LEDs the second. 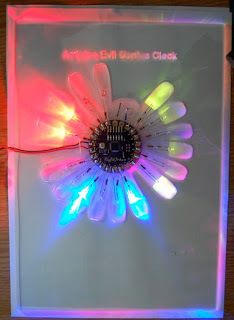 They all fan out from the Arduino Lilypad. 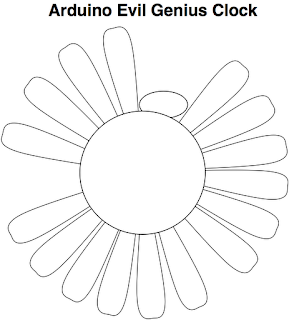 A reed switch is used to advance the clock by holding a magnet close to it. Its a little difficult to photograph, so here it is again on a white background. I quite like the effect of the white background and may fit a backing to the acrylic. The new enclosure does not really do much enclosing. Its just a sheet of 3mm clear acrylic, cut in the shape below. 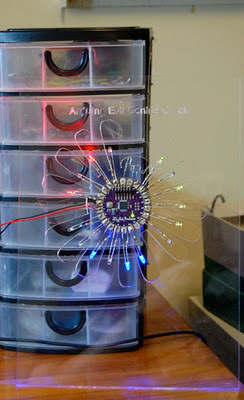 This allows the LEDs to sit in the channels and allows a space in the center for the Lilypad. 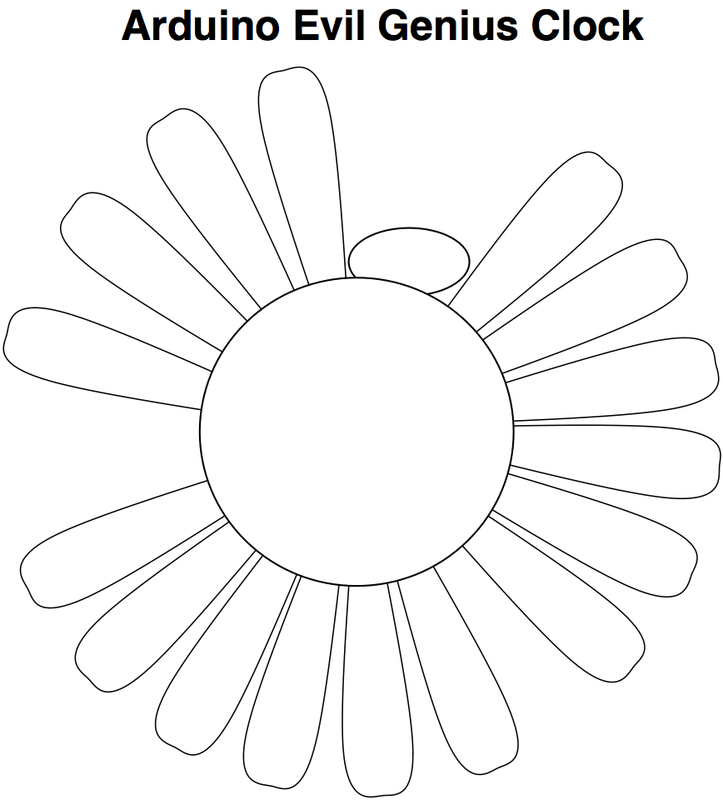 The PDF for the clock face is available on the book's website in the download section. The laser cutter is a Epilog Mini 24 Laser Cutter and I wasn't really taxing it much to cut the acrylic. As well as a laser cutter, Fab Lab has a 3D printer, a Desktop Milling machine, a Vinyl cutter, a large CNC Router, a vacuum former and well equipped electronic workstations. This is all backed up with a knowledgeable and helpful set of staff as well as well as lots of people around happy to help out.